With the holiday season upon us, you've decided to treat yourself to a new PC. Good for you. ;-) With so many choices on the market, picking out components that don't break the bank, yet still offer great performance, can be a challenging task. The consensus in the computer world is that Intel's Core 2 Duo series of processors deliver the best performance, for a reasonable price. If you're going to be buying new parts now, you might as well go that route. There's no sense in spending the same amount of money for something slower. You'll need a good motherboard to go with that shiny pinless Core 2 Duo processor, and platforms based on the Intel P965 Express chipset offer some of the best value at the moment. A P965 Express board is not as pricey as an Intel 975X Express, or nVIDIA nForce 500-series, but it delivers a high level of performance and can run dual ATi Radeon videocards for CrossFire goodness. 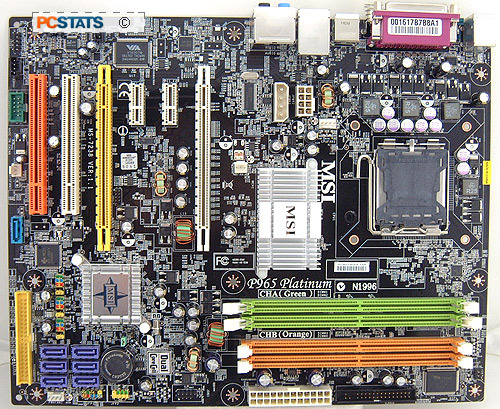 The MSI Computer P965 Platinum motherboard is one such candidate with a healthy dose of enthusiast friendly features to match. The MSI P965 Platinum utilizes the Intel P965 Express Northbridge and Intel ICH8R Southbridge chipsets. It supports all Socket 775 processors that operate on a 1066/800/533MHz FSB. This includes the Intel Core 2 Duo/Extreme, Pentium 4/D/XE and Celeron D to name just a few. Standard equipment includes an Intel PCI Express based Gigabit network card, IEEE 1394a, a Realtek 7.1 channel Intel Azalia High Definition audio controller and an additional Serial ATA II/IDE RAID (0,1,0+1) controller. 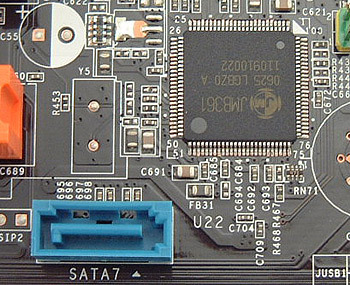 There are seven 3GB/s SATA connections and one IDE channel. Expansion is possible through a PCI Express x16 slot, one PCI Express Lite slot (in yellow, PCI-E x4 transfer rates), two PCI Express x1 slots and two 32 bit PCI slots for legacy devices. The Intel P965 Express chipset is compatible with ATI's CrossFire technology, so you can run two ATI videocards for dual rendering goodness; the only caveat being that the second PCI Express x16 slot (in yellow) has just 4 PCI Express lanes available to it, and two of those are shared with the boards' PCI Express x1 slots. The two PCI Express x1 slots are disabled with the yellow PCI Express Lite slot is populated with a videocard. With a retail price of $154 CDN ($135 US, £68 GBP) the MSI P965 Platinum motherboard offers a good set of mainstream-to-performance features. 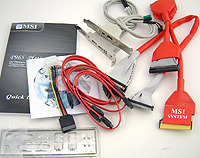 The board accommodates a maximum of 8GB of DDR2 800/667/533 memory in a dual channel configuration - more than enough for Microsoft Windows Vista to run smoothly. User's Manual, Rounded IDE Cable, Rounded Floppy Cable, Four Serial ATA Cables, 1x Molex to Serial ATA Power Cable, USB Bracket, IEEE 1394 Bracket, I/O Shield. The MSI P965 Platinum is full size ATX motherboard at 305 x 245mm in size. The motherboard layout is quite good; the main 24 pin ATX and floppy connectors are all located to the right of the DIMM slots which keeps those cables out of the way, and the lone IDE along the very bottom edge. Of note at the rear I/O panel are four USB2.0 headers, six jack-sensing audio jacks, coaxial/optical audio outputs and a FireWire port. A USB and Firewire PCI bracket are also included, there is one additional Firewire header and three USB2.0 headers on the board itself. If you plan on running a high end Intel Core 2 Duo system, you're advised to upgrade your power supply to something that's ATX2.0 compatible and has an ESP12V connector. The MSI P965 Platinum will run on older power supplies but older units are not designed to handle the power requirements of modern machines. A compatible power supply is definitely required if you plan on running a dual videocard setup. This Corsair HX620W PSU is a good example. The MSI P965 Platinum motherboard is compatible with ATi's CrossFire technology, that's why there are two physical PCI Express x16 slots on the motherboard, though only the primary slot (in white) gets a full 16 PCI express lanes to itself. 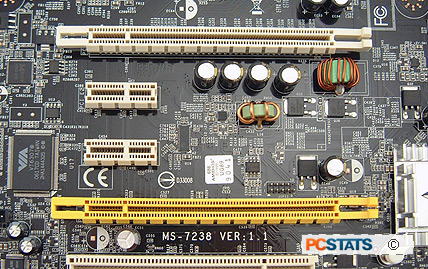 The yellow PCI Express Lite slot has four lanes, two of which come from the two PCI Express x1 slots when its in use according to MSI documentation. It's nice that MSI place the two PCI Express x16 slots far apart. Dual slot videocard coolers have become standard gear, so cards to closely positioned create hot spots. With the P965 Platinum at least you get some space for air to get in. The Intel P965 Express and ICH8R chipsets get quite warm, but to keep noise at a minimum large passive heatsinks are used. This motherboard will operate best with good internal system airflow. The MSI P965 Platinum motherboard is equipped with a JMicron 8361 Serial ATA II/IDE controller. Intel has done away with all IDE channels in the ICH8R which seems a bit premature. In any case you have one IDE channel available which will most likely be for the optical drives. Six of the boards' 3GB/s SATA II headers (purple) are native to the ICH8R southbridge, and support RAID 0/1/10/5. The seventh SATA II header (aqua), care of the JMicron chipset, supports RAID 0/1/JBOD with the lone IDE channel. The user manual is well done, providing novice users with enough guidance to make it through hardware installation. Everything is explained in an easy to understand language. MSI colour coordinates the memory slots with green and orange colours to indicate memory channel (as in A or B), rather than which slots a pair of memory modules should occupy to enable dual channel memory support. With the MSI P965 Platinum, you must put the memory in different colour slots in order to enable dual channel memory support. Dual CoreCell (dual for the two processors) is the fancy name for MSI's IC which controls things such as dynamic overclocking and voltage control, fan adjustment and temperature monitoring. Most enthusiast grade motherboards come with a similar feature. CoreCell is an excellent tool for novice enthusiasts who want to get into the world of overclocking, but don't yet know where to start. Just be careful though because CoreCell does offer values high enough to damage hardware if you're not careful.